So, if you read the last post, you know I’m blogging my way through a rough draft of a chapter on the visual culture/iconography of working class self-education. 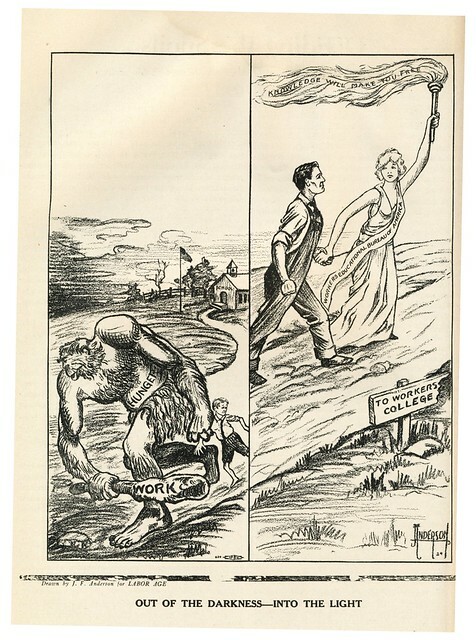 As with most popular political cartooning, those of labor and the left were usually simple (often simplistic), direct and frequently over-the-top. I wouldn’t be the first to note the strongly masculinist messaging of many cartoons, or to suggest that we can read into these images the ideology of the movement, warts and all. The scholars that have influenced my thinking most on the topic are Liz Faue (great chapter on labor cartooning in 1930s Minneapolis that drew women out of the movement), Roland Marchand’s work on advertising and corporate public relations (particularly the chapter in Creating the Corporate Soul on the PR response to industrial unionism in the 1930s), and Barbara Melosh’s beautiful book on New Deal art and theater, Engendering Culture. Let’s start with some straight-forward visual vocabulary of education and ignorance: upward and into the light. Like a lot of conversations about personal and social transformation, the imagery of workers’ self-education used simple darkness/light and down/up oppositions to give their images direction and meaning. The iconography of working class self-education often juxtaposed images of clean, upright and modern self-educators with various negative counterparts signifying ignorance, vice, or exploitation. 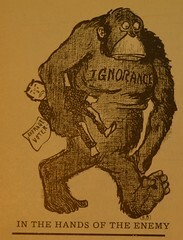 Like this image of “Ignorance” as an ape clasping the “average voter” under its arm by the Socialist editor Barnet Braverman, left wing cartoonist often focused on the negative: ignorance and powerlessness. When positive enlightenment does appear, it is frequently in the allegorical female figure, guiding workers upward or shining a light in the darkness. In John F. Anderson’s “Out of the Darkness—Into the Light” we get both bestial ignorance and the goddess of learning. The two-panel full-page cartoon appeared in Labor Age in 1924. In the first panel, a caveman-like figure with “HUNGER” on his belly and a club labeled “WORK” pulls a young boy away from an idyllic country schoolhouse. In the second panel the boy, now an adult wearing workers’ overalls, walks hand-in-hand on the way to a “Workers’ College” with a female figure wearing a sash labeled “Workers Education Bureau of America” and holding aloft a torch lighting the words “Knowledge with Make You Free.” Born in Stockholm, Sweden in 1878, Anderson’s family migrated to the western U.S. when he was about 10 years old and he went to work shortly afterwards attending grammar school for less than a year while he worked. He apprenticed as a machinist, and worked in railroading around St. Louis where he became active in the International Association of Machinists (IAM). He rose to be a Vice President of the IAM and even contested the presidency, but lost. In “Out of the Darkness,” Anderson was likely commenting on his own childhood. He also put into pictures a message that was familiar to those in the workers education movement in part because so many had also been child workers. As a member of the New York Central Labor College put it in 1926, “The failure of our economic and political system to function socially has forced thousands of children into industry too early, thus depriving them of their educational heritage with great loss to industry and the state, and to the children themselves. This loss has been felt most keenly by those whose minds have not been crushed by our autocratic educational or industrial system or by both. Hence the constant striving of these adults for education which will enable them to function more effectively as workers and as citizens and to enjoy the cultural values of life.” But the “Workers College” imagined in the cartoon was somewhere in the future, enlightenment was a process with a definite, but as yet unrealized, destination. The child and the adult in the cartoon seem to be on the same road, but heading in opposite directions. What’s more, the cartoon suggests that the road toward workers’ education re-balances male worker toward heterosexuality (albeit with an mythological woman). Many associated child labor with sexual danger and deviance during the Progressive Era, and I think it not unreasonable to read HUNGER in the cartoon as the potential for sexual violence, as well as a symbol of evolutionary backwardness and carnality. In the context of the Progressive Era conversation about evolutionary backwardness, the “racial” characteristics of living peoples (which at the time encompassed what we would call ethnicity and race) were almost always intertwined with the presumed long-term changes in society we call modernity. So “Hunger” and “Ignorance” in these cartoons can be seen in racial terms, although it would be interesting to see if either Braverman or Anderson have any statements directly on the topic. This entry was posted in History, Iconography, Labor, Research and tagged Barnet Braverman, education, enlightenment, iconography, ignorance, John F. Anderson, labor education, labor history, modernity, race. Bookmark the permalink.